Farago made small scale replicas of her handbags, which were each be housed in a separate room of The Doll’s House: A Miniature Gallery, Preston. 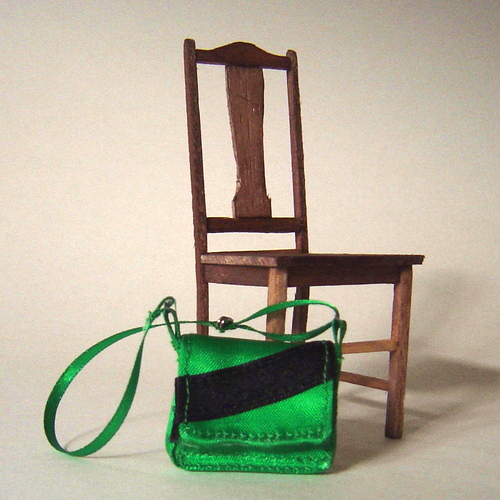 A constant in all the rooms is a mini replica of a kitchen chair which each handbag hung from, sit on, or lean against. There are four mini handbags. Each one very different from the other. There is a brown satchel, rather sad and confused looking, which represents a period of transition. The bright green bag represents a new phase – a fresh and punchy time. The little red old bag was a gift, bought at a fundraising auction, it is happy, cheery and optimistic. A new love. The denim bag with Japanese fabric was purchased in Japan during a time of travel. It also represents a lifestyle shift.